Are birds monogamous? Why do kookaburras laugh? Is the ivory-billed woodpecker really extinct? 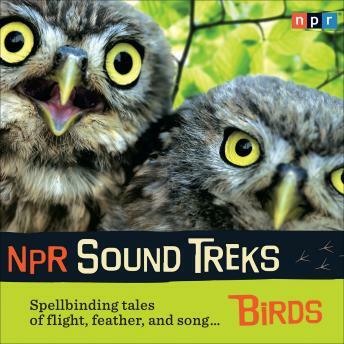 These fascinating stories feature the delightful and exotic sounds of birds, plus astute and informative commentary from bird lovers, bird experts, and sometimes birds themselves. Learn how naturalist F. Schuyler Matthews translated bird song into musical notes. Discover how the city of Chicago has drawn purple martins back to Lake Michigan, their historic habitat. Find out everything you want to know about the lyrebird’s glorious tail. If you’re a bird lover, this is for you. The NPR Sound Treks series features outstanding audio documentaries, stories, and commentary from the NPR archives. Each volume features sounds from nature, insights from experts and others who love the outdoor experience (naturalists, zoologists, biologists, adventurers, even a cowgirl), and vivid storytelling that captures the excitement of the wilderness.